Skytrails Aviation, Inc. ("Skytrails") is a full service fixed based operator ("FBO") at the Van Nuys Airport, the busiest general aviation airport in the United States. The facilities include two locations at the Van Nuys Airport, encompassing over 18 acres, and is home to over 150 aircraft from the most modern business jets to recreational aircraft. Skytrails retained M&A Capital to target a broad universe of financial and strategic investors in order to maximize shareholder value. 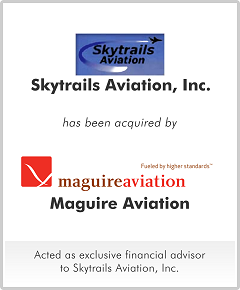 Skytrails chose to sell to Maguire Aviation because the price was attractive and Maguire Aviation indicated a commitment to Skytrails' business plan and employees. Maguire Aviation is an FBO operator at Van Nuys Airport, providing a variety of services, including fueling, ground handling and maintenance, catering and travel coordination, and aircraft management & sales.